After having double digit power play opportunities in each of the last two games, the Quinnipiac University Men's Ice Hockey team has failed to put the puck in the net on the man advantage since the fifth and final goal of the UConn game they won a week ago 5-2. 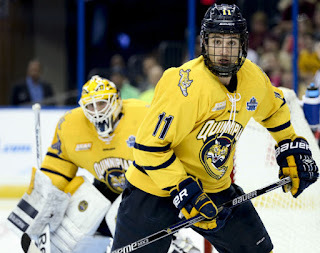 Quinnipiac is now 6 for 55 on the man advantage which 10.91% which ranks them 45th out of 60 teams in the country (The Ivies have yet to play) and they are only two spots ahead of fellow 2016 Frozen Four participant, Boston College. The last two games you have to give credit to Boston University (95.3% PK) and UMass (91.2% PK) as they both have outstanding penalty kills early on in the season. However with the amount of opportunities the Bobcats have had, (Quinnipiac leads the country with 55 power play opportunities) you would expect they would have more than six goals. So far this is the worst power play from a statistic stand point from a Rand Pecknold coached team in the last 15 seasons dating back to the 2001-02 season (Quinnipiac's 1st trip to the NCAA's). Below are the power play percentage's from the last 15 years showing how well Quinnipiac has been compared to this season. What is the reason for the Quinnipiac power play struggles? It is a combination of things from losing players like Travis St. Denis to graduation and Sam Anas and Devon Toews to the pros after their junior seasons. Those three players combined for 62 points the power play (22 goals, 40 assists). Losing assistant coach Reid Cashman to an AHL job hurt as well as he was the guy who ran the 1st power play unit. Coach Pecknold also cited a lack of practice time as a factor as well. With the Bobcats not playing again until November 4th on the road at Clarkson, this should give Pecknold and the rest of the coaching staff a big opportunity to work on the power play and try multiple combinations. It also seems like Quinnipiac is cycling the puck way too much and not getting enough shots on net. They also seem to have trouble making crisp passes on the power play as well. Taking more shots while even if not the best of look might get a redirection that leads a goal. Quinnipiac has been able in the past to create traffic in front of the net on the power play to create success. They need to be able to do that if they are going to turn the power play around. Using players such as Tim Clifton, Scott Davidson, Craig Martin and even Tommy Schutt who has a knack for scoring dirty goals might help cause the chaos they need in front of the net. 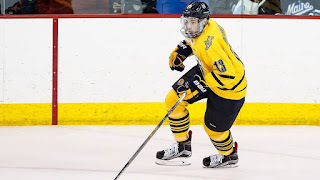 Not having Chase Priskie on the power play (out with an undisclosed injury) has hurt Quinnipiac as he is a player that has been able to run the point and generate power play points. The power play should improve a bit when he returns. If I was in Rand Pecknold's shoes, I'd like to see a first power play unit of freshman Brogan Rafferty and Connor Clifton on the points until Chase Priske returns. Rafferty has been almost a point per game player so far in his short time in Hamden (1 goal, 5 assists) and has led the team in points so far. Joining them on the top unit I put Tim Clifton in front of the net to cause havoc along with Landon Smith and Andrew Taverner on the half walls respectively. On the second unit I would use Derek Smith and Bo Pieper at the points with Tanner MacMaster and Thomas Aldworth on the half wall and Scott Davidson in front of the net. Once Priskie returns from injury, this should strengthen the point positions on the power play. There is still plenty of time in the season to correct the power play but if similar results happen in future games, then the Bobcats are going to have to grind more games out than they have in the past. The talent is there on this team to fix the problems, the coaching staff just needs to figure out which pieces fit in the power play puzzle.